Getting married in Italy means that you may choose for your favourite Italian wedding ceremony — you can get legally married with a civil wedding in a historical Italian Town Hall — or you may choose for a catholic ceremony in a beautiful Italian Church — another option is a symbolic blessing which can be held in an Italian garden or in a courtyard of a beautiful Tuscan villa. A wedding abroad in Italy means that you may choose for your wedding ceremony: you can get legally married with a civil wedding or you may choose for a catholic ceremony which is performed in a beautiful Italian Church, under the condition that one of you is a Catholic. Another beautiful option is a symbolic blessing, which can be held in an Italian garden, a courtyard of a beautiful Tuscan villa, or under olive trees – all places where we realize your personal weddings abroad in Tuscany! Protestant or Anglican wedding ceremonies require a supplementary civil wedding before,which can take place in your home country or in a Town hall in Italy. If you prefer a symbolic blessing we suggest various wonderful wedding locations to you, where your destination wedding in Tuscany will become a fairy tale wedding. A blessing in an Italian garden with terracotta pots and lemon trees, or in a special atmosphere under olive trees or in a courtyard of an Italian villa – all unique places! A civil wedding in a Town hall in Italy is legally recognised in your home country. A Catholic wedding in Italy will be registered in the Catholic Parish Church in your home country, and it can be also legally recognised, if we present the legal requirements at the Italian authorities. Of course we arrange all necessary steps and appointments on your behalf. A symbolic blessing is not a legal wedding. You need to find an English speaking priest for your wedding in Tuscany or Umbria? Or a minister for your blessing at your wedding location? We can provide both for you. We inform you about the documents required for a marriage in Italy. 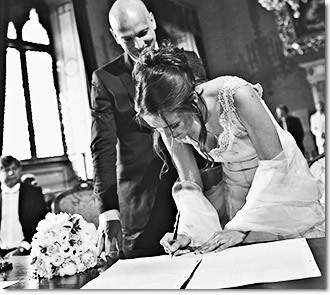 We apply for your permit to get married in Italy before your arrival. Based upon your personal situation (nationality, civil status, residence, etc.) we will check which documents are required for which governmental offices. We know the Italian laws and the times involved in the relevant bureaucratic procedures. We make sure that all paperwork will be processed in a timely fashion. We deal with all the paperwork from the first appointment to the legalisation of the wedding certificate. Naturally, all your personal information will be kept confidential and will be handled with due care and respect, as required by the Data Protection Laws. In Italy the presence of a sworn interpreter during the civil wedding ceremony is mandatory, since the wedding ceremony must be read in Italian. We work with the best interpreters who will be present all the time and help you through all the language difficulties. Members of our international team speak excellent English, Dutch, German and, of course, Italian. 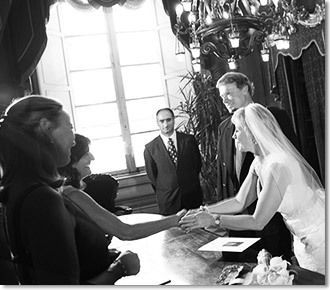 Interpreters add much to mixed weddings and bilingual-ceremonies. All our interpreters not only translate but also help guide you through the whole day. It is always best to begin the planning of a wedding as soon as possible. If you decide at the last minute to marry in Italy on short notice. Well, even then, we will try to make the impossible possible. In general, the most traditional wedding months are May and September, but the season often stretches from Easter to October. If you wish to celebrate your wedding in a certain church, town hall or villa, you should plan a good time in advance. The earlier you decide on the date, the more probable will be the availability of your desired location. Please remember that choosing particular date – such as 15/05/2015 or 18/08/2018 – probably means that others will have the same idea. The early bird catches the worm! The size of the wedding party is important, too: the more guests you have, the more accommodations there are to be planned! Give us an idea of how you envision your wedding, and we will tell you how much advance time you will need to start your preparations.